The procedure given in Matthew 18:15-17 is probably intended for more serious infractions that may result in excommunication if taken to the bitter end, but I think that the principle is still valid for interpersonal grievances as well. If you are upset with someone because of something they did to offend you, and you wish to resolve the issue and preserve the relationship, announcing your frustration to the world is not likely to help your cause. It is possible that the other person has offended you without even realizing it. If that is so, that matter will be resolved quite easily once you share your hurt. If it was an intentional slight, you will at least know where you stand. We are asked to forgive (Matthew 18:21-22, Luke 17:3-4), and we are asked to love our neighbour (Luke 10:27), but we are not required to remain friends with anyone who intentionally abuses us. We can be respectful to them. We can be gracious and civilized. We can follow God’s steps for reconciliation. But if, in the end, they don’t want to do their part to contribute to a healthy relationship, you do not have to continue to associate with them. If they are family members, of course, it may not be as easy as all that, and that’s where the graciousness and civility will be essential. Nonetheless, we don’t have to go out of our way to spend time with them. At the point where they are ready to adjust their behaviour, because you have already forgiven them, you will be ready to renew the relationship. David Teems, author of Majestie: The King Behind the King James Bible, has said, “God is not in the business of explaining things. He’s not obligated to explain anything to us. But we live in a generation today where we feel like we’re entitled to an explanation.” Yes, wouldn’t it be nice if God would let us in on His plan and tell us what our role is in it? Decision-making would be so much easier. Deuteronomy 29:29 lets us know that that won’t happen. God has all the answers, and He only gives us some of them. Sometimes He gives us answers in the form of thoughts or knowledge, but He most certainly gives us answers through the Bible. Because we have access to His Word, we have become responsible for the information that it contains. Proverbs 25:2 indicates that we (even though we aren’t kings) should not only feel free, but obligated to search out the truth, to find the answers, to investigate the best way of doing things. The title of Proverbs 25 tells us that these proverbs were collected by King Hezekiah, so it is natural that he would be concerned about the responsibility of kings to lead and govern their people. Today, however, we are all required to lead and govern our own lives, and the wisdom of this passage is just as valid for us. Investigate, study and learn what it is that you can know, but realize that you can’t know it all. If we could know all that God knows, He wouldn’t be God. We can know enough, however, to have faith in His trustworthiness. The passage in Deuteronomy says that we have this information so that we might obey God’s laws. James 4:17 tells us that because we know what is good, we are obligated to do it. To be honest, sharing was not really the point of the parable, but it is interesting that the five virgins who wouldn’t share were not condemned for it. They were commended for being prepared, while the ones who had not brought enough oil to get them through the night were called foolish and were banned from the wedding feast. Preparation is the point of the parable. Since it is a parable, the focus is to be spiritually prepared for eternity. The oil is representative of the Holy Spirit. There are many who call themselves Christians, perhaps because their parents did or because that’s the kind of church they go to, but only those who have truly accepted Christ as Saviour will be invited to the eternal wedding feast. This is your own decision--something you have to do on your own. No one on earth can share eternal life with you, but you can accept it as a free gift from God. Matthew 6:19-21 outlines for us what our attitude toward money and material possessions should be. It is not that we need to take a vow of poverty, but we need to prioritize what is important to us. It is not wrong to have money or material possessions, but it is wrong to rely on them as our source of provision, for all good gifts come from the Father above. (James 1:17) Anything that is of earthly value is temporal and subject to destruction or theft, but things of eternal value can never be taken away or destroyed. God, however, as in all things, gives us the freedom to choose what matters most to us. The tenth commandment is that you shall not covet. (Exodus 20:17) In Proverbs 23:17-18, the term used is envy. They mean the same thing. Don’t be jealous of what your neighbour has that you don’t. I’ve been guilty of this lately. I don’t envy any particular neighbour, or desire anything that was gained through inappropriate means as Proverbs 23:17 suggests, but I have certainly desired to have things be different than they are. I and my family have been going through a lot of strife lately, from car accidents that resulted in injury, unceasing pain and the hassle of replacing a vehicle with insufficient funds to family members with brain cancer and kidney transplant rejection and friends who are suffering from cancer or have lost loved ones. Everything just seems to be so hard lately, and I envy those who appear to have things more under control than I do. Of course, that is just my perception and possibly an illusion. I guess we all have our struggles. I think the key is to control your thoughts. (Romans 12:2, Colossians 3:2, Philippians 4:8) Instead of focusing on how someone else is better off than you are, focus on what you can be thankful for. Focus on the hope you have for your future, and know that when we get to eternity in heaven there will be no more pain, no more sorrow and no more strife. (Revelation 21:4) We also need to focus on the character and promises of God. We know that He is a good and loving Father (Ephesians 2:4) who desires to give good gifts to His children. (Matthew 7:11) We know that even though all things are not good, all things work together for good for those who love God and are called according to His purpose. (Romans 8:28) There is hope not only for peace and joy in eternity, but also for things to be better on the other side of this trying time. I was having a conversation with my husband the other day, and I said, “The opposite of love isn’t hate; it is the absence of love. It is indifference.” He pondered that for a moment, and then did what every good techie does: he googled it. It turns out that, even though I was processing that thought for the first time, others had said it before, most famously holocaust survivor and Nobel Peace Prize winner, Elie Wiesel. So, how do we know whether we are truly being loving or not? It’s not about feelings; it’s about conscious decisions. It is a choice. I John 5:2-4 tells us that we know we are loving others when we love God and keep His commandments. His commandments as summarized by Jesus are to love God and love others. (Matthew 22:37-40) Jesus also said that obeying his commandments is a natural progression of love for Him. (John 14:15) Later in the Gospel of John we read that if we obey Christ’s commandments, we will remain in Him just as He has obeyed His Father’s commandments and remains in His Father. (John 15:10) One assists the other: If we love God we will obey His commandments, and if we obey His commandments His love will remain in us. These days, we use the term “love” quite loosely. I love chocolate. I love blue skies. I love my husband. These are examples that represent emotions and expressions of enjoyment. The kind of love discussed in these verses is unconditional, from the Greek word agape. A good summary of what that means and how it can be demonstrated practically is found in The Love Chapter (I Corinthians 13, particularly I Corinthians 13:4-7 ), but in general it means that we choose to love. Our love is not based on what we can get out of it, or even what we can give (and then feel good about). It is about loving others because God commands it, whether we particularly like them or not. That is something that is not easily done even if we really want to. It is only possible if we let the love of our Heavenly Father flow through us. John 3:16 is probably the best known verse in the Bible. Lots of children have memorized it in Sunday School, perhaps because it sums up the whole gospel so succinctly. God loved the world so much that in order to redeem the world, He allowed His only son to die as a sacrifice for us. That kind of love is hard to fathom. And it was for the whole world. When Jesus spoke these words, the people of the time thought that the Messiah was coming only for the Jewish people, and that the Gentiles would be condemned. They expected judgement, but John 3:17 clarifies for us that Jesus did not come to condemn us, but to save us. All we have to do is believe in Him. It is our choice. The creator of the universe could choose to make us do whatever He wants us to, but He doesn’t. He loves us so much that He lets us do whatever we want. When we do choose to believe in Him though, we are rewarded with eternal life. The Greek word used here for life represents not only life after death, but life here and now, and it represents the quality of life as much as the quantity—the more abundant life that John 10:10 describes. 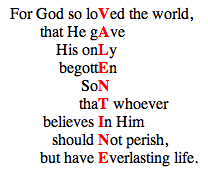 I chose this verse for today because I think of it as a Valentine verse. I will share the Valentine with you here just in case you have never received it in an e-mail. Happy Valentines Day everyone! I’m a bit of an idealist, so I don’t like it when things go wrong, especially when bad things happen to people who don’t deserve it. It’s one thing to deal with the consequences when you’ve made a mistake, but if you didn’t do anything wrong, it just seems so unfair. Either way though, it is good to be able to call on God to rescue you. Do you ever wonder if God really hears you when you pray? Sometimes we feel like the pain, frustration and struggles will go on forever. He says that He has a good plan for you (Jeremiah 29:11), but do you ever want to negotiate with Him? Tell Him your side of the story? Give Him your ideas for the plan? I think that the Psalmist David must have felt that way when he wrote Psalm 13. In the first two verses he asked “How long?” four times. He felt ignored, anxious and threatened by his enemy. We don’t know for sure, but he may have been running for his life at this point. David didn’t end his psalm the same way he started it though. He moved from complaint (Psalm 13:1-2) to prayer (Psalm 13:3-4) to praise (Psalm 13:5-6). Philippians 4:6 tells us not to be anxious about anything, but with thankful hearts to present all of our requests to God. This is what David did. He asked the Lord to answer him, to revive him, and to save him, not only so that he would be saved, but so would the reputation of God’s name. What caused David to turn from despair to praise? Hope in God’s unfailing love and mercy. David had faith that God was still God and would keep His covenant with him. We must do the same when we face trials that have gone on so long that we think they will go on forever. When we have lost our joy and our hope, we must cling to our faith. We must remember that God is God and more importantly that we are not. Even when we don’t understand what He is doing, we must believe that He does. We know that He understands every trial that we go through (Hebrews 4:14-16), that He will not give us more trials than we are able to bear (I Corinthians 10:13) and that He longs to give good gifts to His children (Matthew 7:11). Think back on how God has brought you through trials before. He will again.